We’d love your help. 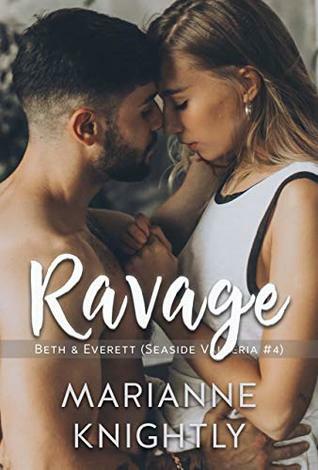 Let us know what’s wrong with this preview of Ravage (Beth & Everett) by Marianne Knightly. Everett wants her. In bed. On the stairs. Against the fridge. He wants the inexplicable connection they have to deepen and grow. Beyond the bed, he wants to soothe her aches and comfort her, defend her against the evils of the world. But his own world is crumbling around him, and he needs her, too. Needs her kindness and warmth, her strength and comfort. They nearly made it, they almost had everything. Until one misunderstanding derailed it all. Beth’s never been the long-term lover and not by her choice—by theirs. She’s the quick fix and the one-night stand, the one they use and leave. As the curvier version of her identical twin, Beth has always been compared to her—and never favorably. Throw in the rough way she grew up, her cruel mother and never-ending family drama, and no one’s wanted Beth to stick around. What they had was beautiful and intoxicating and dizzying, and warm and lovely and safe. But it won’t last…not now…not after everything fell apart. Can they ever find a way back to each other? This book contains content suitable for mature audiences only. This is a standalone book in the series, with no cliffhanger. However, you may prefer to read the other book in the series first. Welcome to Valleria, a country nestled along the Mediterranean. Whether it’s the small towns or larger port cities, you’re sure to find a friendly face—or more—along Valleria’s seaside shores. Far from the politics of the palace, follow this group of friends as they find love, support each other, and perhaps even meet a royal or two at the local Masillian pub, the Seashell. To ask other readers questions about Ravage (Beth & Everett), please sign up. I love this story. Ups and downs but they still get back to each other. Keep it up Marianne!